Man, this week is quickly approaching it's end. I had mentioned I had some ideas that might work for Grandparents day this coming Sunday, well, looks like only one of them was good enough to share. 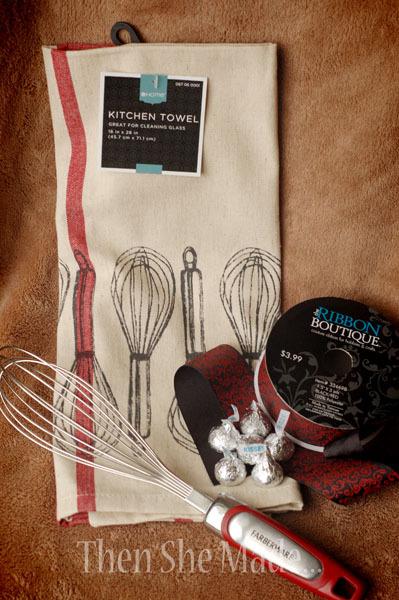 And, really, this idea could be used for other holidays or just-because gifts too. 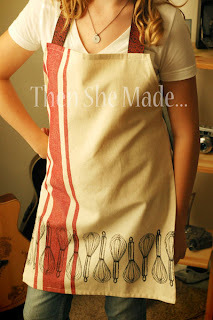 Recently my daughter and I made a bunch of dish towel aprons for her young women's class. 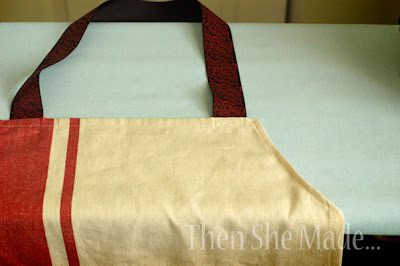 They turned out adorable and so I thought I'd show how you can make a really super cute, and really super easy, apron from just one dishtowel and some ribbon. Plus, since the dishtowel I found at Target had whisks on it, I thought I'd through in a whisk with kisses too so you can turn it into a fun little gift for Grandma. Let's start with the apron. 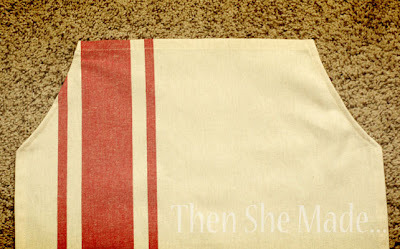 Step 1: Find a super cute dishtowel then wash it. It's really important that you wash it otherwise your apron may shrink after you have it made and well, that would NOT be good. Step 2: Iron it. So far so good, right? Easy steps. Step 4: With the dishtowel folded in half, cut on a curved angle a small portion off of the corner as shown above. Here's an up-close photo of the cut. Be sure not to cut too much off or it will look funny once it is sewn. It will make more sense in minute. Step 5: Once you've made your cut, open the towel up and then turn the towel over so the right side is down. 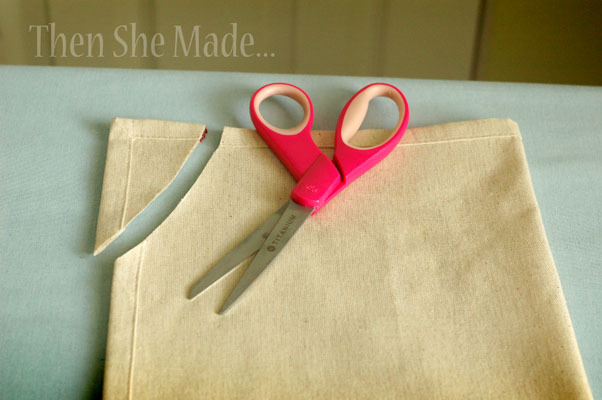 Then, carefully fold the cut edge over about a 1/2 inch or slightly less. Iron. 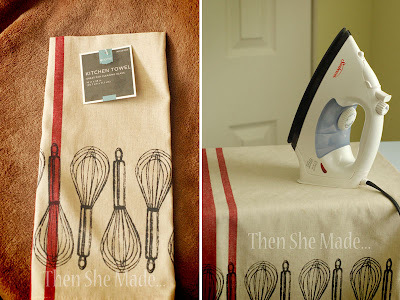 Then fold over again and iron again. Once ironed, pin in place. 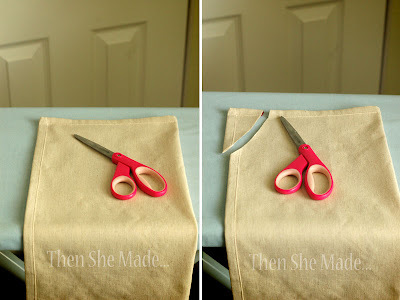 Do this step to both sides of the towel where you cut. 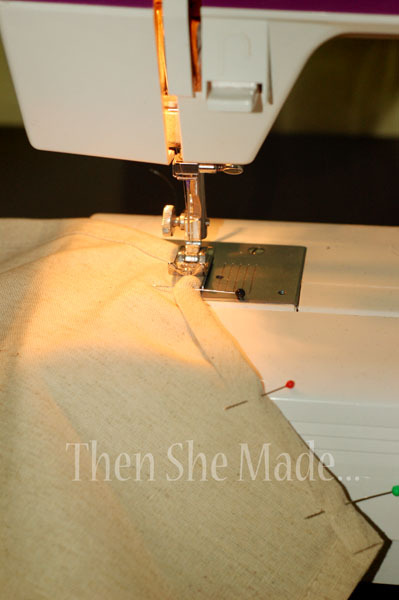 Step 6: After you have each side folded, ironed, and pinned, sew them in place. 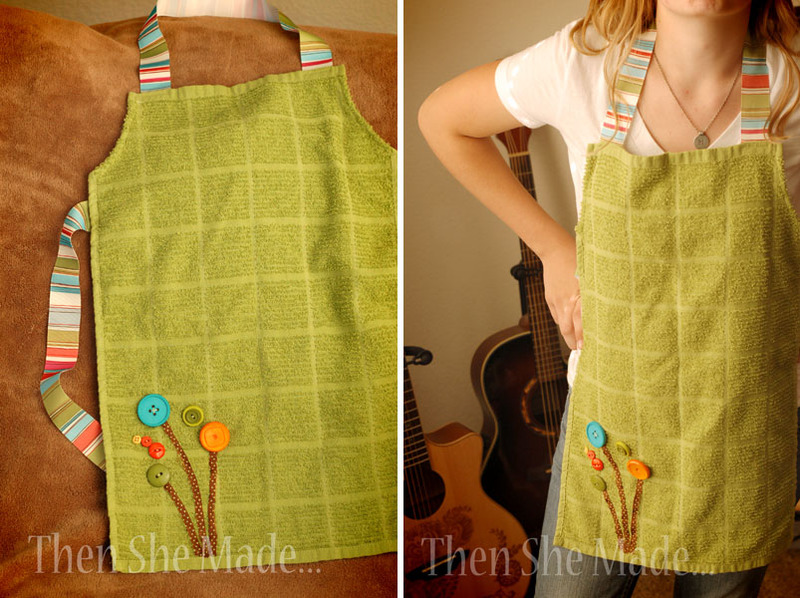 When you have both sides sewn, you should have something that looks like the photo above. You can see now how the part you cut out makes the area for the arms. Step 7: Next we will add the ribbon. You need to cut three pieces of ribbon. One will be for the neck and the other two will be for the side ties. Here's where it gets a little tricky. There really isn't a set length to cut. To determine the length you have to think about the person who will be using the apron. Are they small chested? 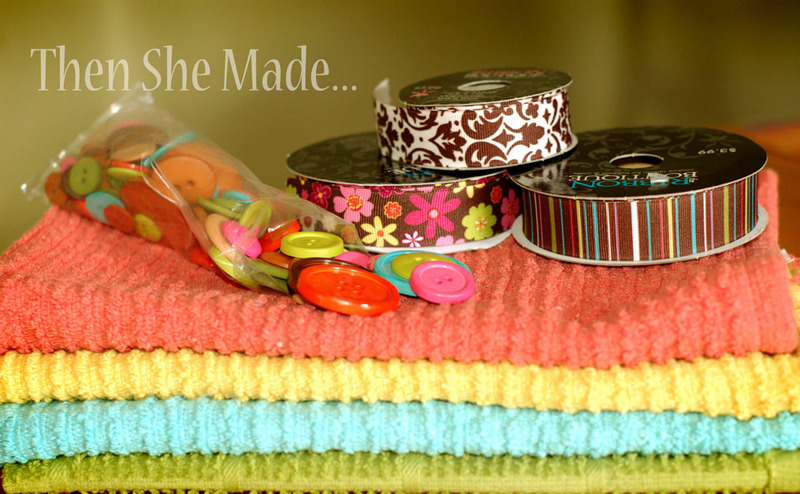 If so, cut a shorter length for the neck ribbon. If they are larger, cut it longer. The ribbon for the neck will determine where the apron lays on the chest. Does that make sense? So, with that said, I cut my neck piece about 27 inches long and my side ties at about 29 inches. This is for what I assume is just an average size apron wearer. Then, after you have the ribbon cut, carefully singe the ends. 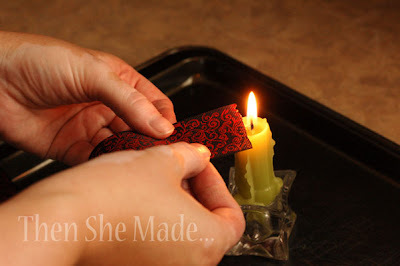 Do this by holding the edges of the ribbon close to an open flame. DO NOT put it in the flame. You don't want to burn it. You just want it close enough to melt the edges. 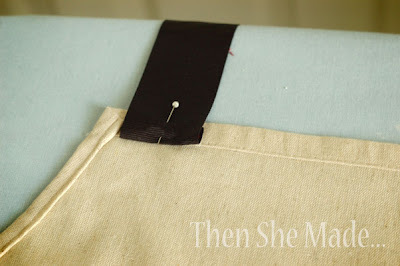 This will prevent the edges of the ribbon from fraying. Step 8: Now that your ribbon is cut and singed, take the piece for the neck and fold the end over about 1/2 inch. 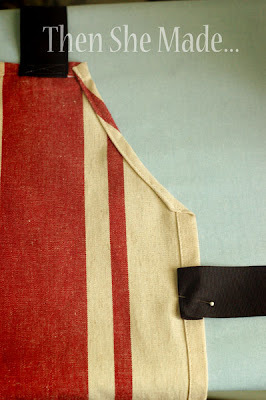 Then pin it to the back side of the top of the apron. Keep in mind you want the front side of the ribbon to show on the front side of the apron so be careful in how you pin/sew it. Fold and pin one end of the ribbon and then once in place, fold and pin the other end of the ribbon onto the other side of the top of the apron. Then sew in place. Once you have both sides of the ribbon sewed down it should look something like above. Also, here's a close up shot of the stitching. (click on the photo to see it bigger) You can sew the ribbon on any way you want but I found it works well to sew it in a little box with an x in the middle. It holds really well and looks a little more polished too. Step 9: Next, add on the side ties. 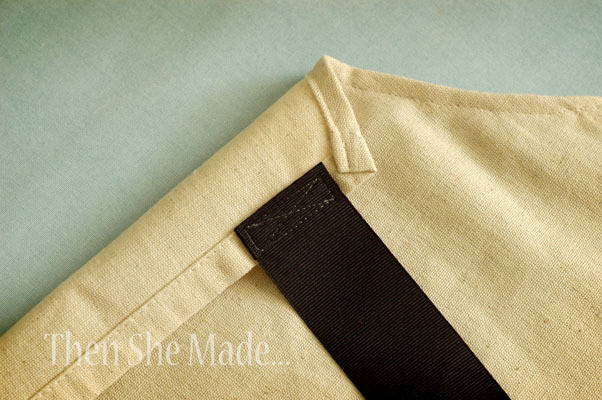 Add them the same way you added the neck loop only just sew down one side of the ribbon to each side of the apron. Now, as I mentioned at the beginning, if you want to make this and give it as a gift for Grandparents day, you'll want to add in the whisk and kisses. "We WHISK you a very happy grandparents day that is filled with lots of love and KISSES!" 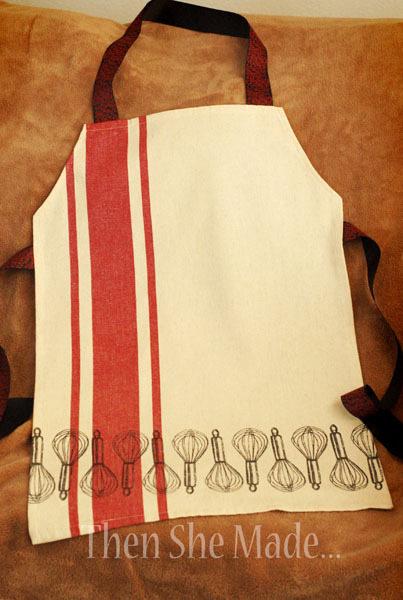 If you give the whisk and the apron together, it would make a nice simple gift that I'm sure grandma will love. I picked up the towels above at Walmart, they are just plain terry cloth dish towels but they were only a $1.27 each. Can't go wrong with that. Then just follow the steps above to make the apron. Once it's done, add some cute buttons to make a fun design on the bottom. 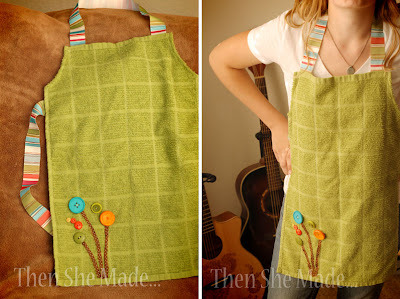 It will dress it up a bit and make a super cute apron. I love this! I've been looking for something the girls can help with and I think this is it. This is totally a 2 bird- one stone thing for us! Love it and want to make one!! Found you through pinterest & so glad! These would be perfect for a baking party for kids! Then use my mom's embrodery machine to put their names on... :) thanks for sharing with us!